The Old and New Testaments - from the 1899 edition published by John Murphy Company, Baltimore, Maryland. Imprimatur: James Cardinal Gibbons, Archbishop of Baltimore (the whole revised and diligently compared with the latin Vulgate by the Servant of God Bishop Richard Challoner). The Old and New Testaments and Historical and Chronological Index have been beautifully retypeset, faithfully to reproduce the original 1899 Gibbons edition. The text is set in the classic Century Expanded font, which was originally used in the 1899 edition, and has been lovingly typed line by line to represent exactly the original edition. The Family Register pages have also been digitally typeset and redrawn. Included in this edition: * Three Papal encyclicals regarding the importance of the Holy Bible: PROVIDENTISSIMUS DEUS - Encyclical of Pope Leo XIII - On the Study of Holy Scripture SPIRITUS PARACLITUS - Encyclical of Pope Benedict XV - On St. Jerome DIVINO AFFLANTE SPIRITU - Encyclical of Pope Pius XII - On Promoting Biblical Studies, Commemorating the Fiftieth Anniversary of Providentissimus Deus *Maps: From the 1911 edition published by Wm. Aleiter Co., Catholic Supply House, Indianapolis. Imprimatur: John Cardinal Farley, Archbishop of New York. Eleven coloured maps digitally redrawn by hand and fully coloured. *Engravings From the 1941 edition published by The Douay Bible House, New York. Imprimatur: Francis J. Spellman, D.D., Archbishop of New York. These thirty-two beautiful engravings recreate key moments in Biblical History. 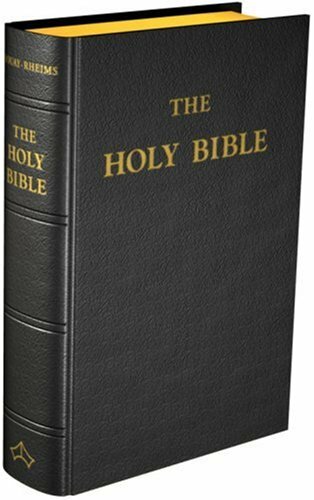 In this edition, they have been scanned, carefully remastered and enhanced, and their captions have been retypeset and corrected to match the appropriate verses in the Bible text.